Andis shares step by step advice to bring out the professional dog groomer in you. Buff, puff and pamper pooches. Professional dog grooming clippers and other tools are a must to stock your dog grooming salon. They're also a valuable resource for dog owners looking to take their at-home grooming skills to the next level. No matter what your reasons for buying professional dog grooming supplies, you can stock up on the essentials, including clippers, tables, tools and shampoos at Every Day Low Prices. A good set of professional dog grooming clippers is the cornerstone for every professional dog grooming kit. Consider these points to choose the right clippers for your (and your dog's) needs. Clipper speed: Most professional dog clippers come in one of two speeds: single and variable. If you're just starting out, single-speed clippers give you solid results with minimal hassle. 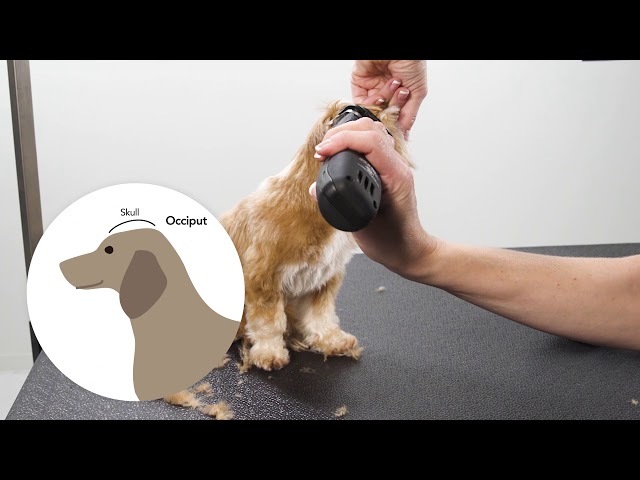 If you're accustomed to grooming dogs, you're better off with variable-speed clippers, which provide added versatility to achieve the perfect finish. Motor speed: The speed and power of the clippers gives you a good idea of how smoothly they'll cut through fur. If you're grooming dogs with dense coasts, you want to choose clippers with the highest motor speed and power level to make easy work of heavy fur. Noise levels: Loud clippers often spook pups. Choose a model that has minimal vibrations and noise for comfortable grooming. Clipper size and weight: Even if you're only grooming one dog, you still need to consider your own comfort. Lighter clippers with an ergonomic design will feel good in your hand even after a long grooming session. Corded vs. cordless: Cordless clippers are convenient for quick touch-ups but they rarely have the battery power for intense grooming sessions. Table height: The ideal table allows you to work comfortably without straining your neck and back. Look for a grooming table with an adjustable height to groom dogs of varying sizes and weights without sacrificing comfort. Size: You want a table with enough surface area to comfortably accommodate the largest dogs you work on. Pick one that's as large as you need while keeping your storage space firmly in mind. If you're short on space, a foldable grooming table might be your best bet. Safety: The safety of the dogs on your table is the utmost importance. Choose a table with a surface that allows dogs to firmly grip it while they're getting groomed. You might consider one with a built-in harness to help keep pups in place while you work. Slicker brushes are ideal for dogs with medium to long hair or curly hair. They're effective for removing mats, but they can cause dogs discomfort if you use too much pressure while brushing. Rakes are ideal for dogs with thick coats. They're effective tools for removing tangles and undercoat. Look for a rake with pins roughly as long as the dog's hair. Bristle brushes are ideal for dogs with smooth, short coats. They remove loose hairs and help stimulate the skin. If you want the most versatile comb, look for a stainless steel, double-sided comb. These durable combs feature an end with teeth that are closer together and an end with teeth spaced farther apart to work through fur and hair of varying thickness and tangles. Once you've stocked up on the big items, you still need a few extras, including scissors, shampoo, conditioner, towels and a dryer. Professionals often tailor their shampoo choice according to the thickness of the dogs' coats and the sensitivity of their skin. Choose professional dog grooming scissors with an ergonomic design. You may consider buying several types: curved blades for contouring, straight blades for straight cuts and thinning shears for shaping. Forced-air dryers use high-pressure air to powerfully dry the dog's coat. Stand dryers let you work hands-free to brush and comb the dog as the dryer works its magic, which is ideal for dogs with longer coats. Low-pressure dryers are ideal for dogs with sensitive coats and delicate skin. They work similarly to forced-air dryers but with lower pressure. Handheld dryers are ideal for flexibility and versatility. Use at the lowest possible heat setting for optimal safety. Cage dryers mount to the structure of a cage, allowing groomers to start drying one dog while working on another.